Learn the Hindquarter amputation (for pelvic soft tissue sarcoma) surgical technique with step by step instructions on OrthOracle. Our e-learning platform contains high resolution images and a certified CME of the Hindquarter amputation (for pelvic soft tissue sarcoma) surgical procedure. Soft-tissue tumours (STT) are a heterogeneous group of benign and malignant diseases accounting for fewer than 4% of all tumours in adults and fewer than 8% of all tumours in children. More specifically soft-tissue sarcomas are rare malignant tumours derived from mesenchymal cells at all body sites. These rare tumours comprise approximately 1% of all newly diagnosed cancers. The incidence of soft tissue tumours is approximately 2000 cases per annum in the UK. Patients may present with a painful or painless swelling that is growing insidiously. Almost 50% arise in the lower limbs (most commonly the adductor compartment of the thigh) and the median age for presentation is 65 years. Concern as to the biological activity of a lesion should arise if the size is greater than 5cm, it is painful, deep to fascia, increasing in size, or represents recurrence of a previously excised lesion. Each of these five characteristics corresponds to an approximately 20% risk of malignancy. Any lesion presenting with features that are suggestive of STT require referral to specialist centres, where appropriate evaluation and staging will take place. Bone involvement by such tumours is rare except in advanced disease or in aggressive, rapidly enlarging tumours where the tumour invades all surrounding structures including bone. In such cases, surgical resection must include the involved bone to ensure complete removal of the tumour. 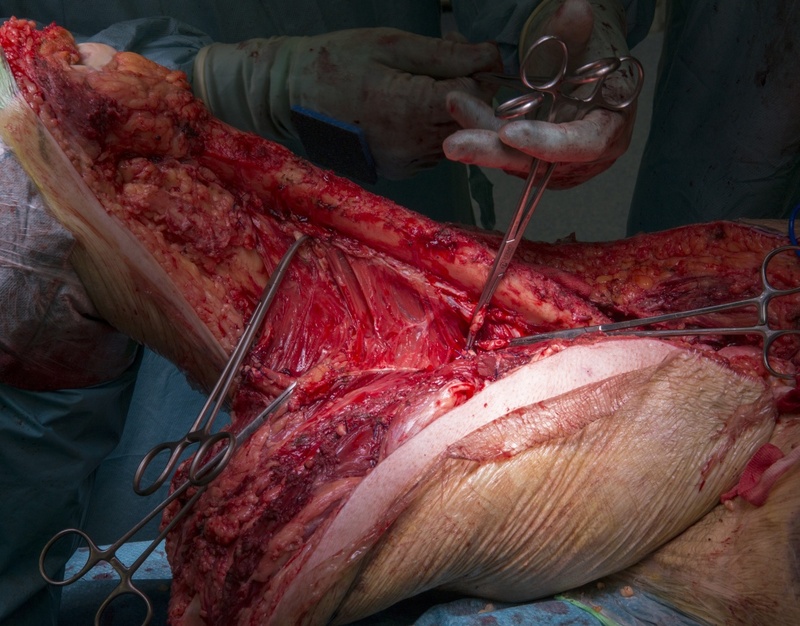 In rare circumstances, this requires amputation where the risk of local recurrence is deemed too high by limb salvage surgery, or where the function of the limb would be unacceptable. Author: Michael Parry MD, FRCS, Consultant Orthopaedic Surgeon.